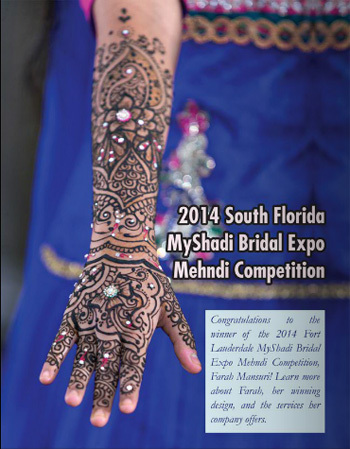 Congratulations to the winner of the 2014 Fort Lauderdale MyShadi Bridal Expo Mehndi Competition, Farah Mansuri! Learn more about Farah, her winning design,and the services her company offers. For those who are not familiar with you or your work, can you share a bit on the formation of your business? I have been the owner of Farah’s Mehndi for over 12 years now. The formation of my business really began with friends and family. I am truly appreciative of their support and for giving me the extra push in life I needed to turn my mehndi passion into my own business. Not many people can say they love their work as I can. To be honest, I was a bit nervous about being in the competition, but I knew it was an amazing opportunity to be apart of a live mehndi competition. This competition gave me the creative platform to showcase the authenticity of my skills and work. Of course, I felt a bit of pressure of course with all the amazing attendees passing by my booth to watch as I applied my winning design! All in all I feel humbled to be this year’s South Florida winner. Mehndi has given me artistic freedom with the endless creative possibilities. Many things have inspired my designs – various styles of jewelry, clothing, nature, fashion, fine art, and other henna pieces. I have been applying mehndi for 12 years, changing my passion of mehndi from a hobby artist to a professional artist. Over the years, I have developed more skills and the word spread about my work. My once hobby, now profession has given me the opportunity to travel to different parts of the United Sates, Caribbean islands, South and Central America to meet thousands of amazing brides and showcase my talent on their hands and feet for their once in a lifetime moment. I first sketched this design out for my own wedding. This design came from a collaboration of designs I have done in the past. I love the fusion mehndi style of intricate work along with the boldness of floral design. And these types of designs photograph beautifully. I also embellished the designs with jewels to accent what the model was wearing, which can be done for all brides during their sangeet or mehndi evening. Other wedding-related serves I provide include selling bridal and contemporary jewelry, bridal dressing, and sari dressing for formal events. There have been many great moments with my brides and their families. One that really stands out is when I received a request to do a destination wedding in Costa Rica. Though I had been a mehndi artist at destination weddings in the past, this time was a bit different. The design chosen by the bride was quite elaborate, and it began at her shoulders moving down to her fingers with her feet done from the knees down. 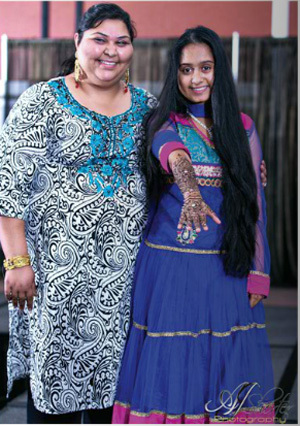 I was astonished to meet someone with the same love and passion for mehndi as me! With such an elaborate design, we naturally spent many hours chatting as I applied her mehndi. We really got along well, and it turned into a great friendship! The economy has affected aspects of life for many, and it has made one more conscious of how they would like to spend their earning. In the elaborate Indian wedding industry, many would say the budgets just become grander consisting of pyrotechnics, grand entrances on elephants/camels/horses, and performances from Bollywood music stars. Invited guests can number in the thousands. Indian weddings seem to be more over the top than American weddings; I can safely say the economy has not burdened my ability to express my art. I can travel to most locations. Over the years, I have traveled different areas in the US as well many of the Caribbean islands and countries in Central and South America. One very important factor is that brides like the work and personality of the artist applying their mehndi. Remember to also book your mehndi artist 4 to 12months prior to the wedding. Be sure to have your manicure and pedicure done before the application of your mehndi. Any kind of skin exfoliation soon after mehndi application will tarnish the color and your mehndi will remain light. 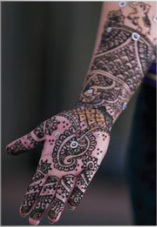 It is best to schedule your bridal mehndi 48 hours before your wedding ceremony to give it time to darken fully. You should only use natural mehndi, so take care as some mehndi pastes now are made with added chemicals. Discuss this with your artist prior to your application. Usually, professional artists have no problems informing you about the ingredients of the paste used for your mehndi. No one in this industry does it for the money; they do it because they are passionate! Find Farah’s Mehndi on Facebook or call 786-208-2277 for more information.